Refill-Here » Earth Day – tell us about your local #refill_here station! Earth Day - tell us about your local #refill_here station! It’s #EarthDay tomorrow (22 April) and our new friends at PCSG have published a blog with their top tips on things you can do immediately to make a difference, because action speaks louder than words. We knew that though, didn’t we! And so do they. Their top tips are all based on things they’ve been doing over the last few years. The blog sets outa few simple steps, which includes highlighting your favourite local café to us! We’ll add it to the website and leave you to get social – at the café, on Instagram or Twitter (tag us @refill_here and #refillrevolution) or send us your #mugshot. Tell us about your local refill station via this form, and we’ll get it on the map. Let’s make a dent, however small initially, into the two and a half billion (yes, BILLION – that’s a lot of zeros) disposable cups that, for a few minutes, lead a short and rather pointless life each year before ending up in the bin or on the floor. 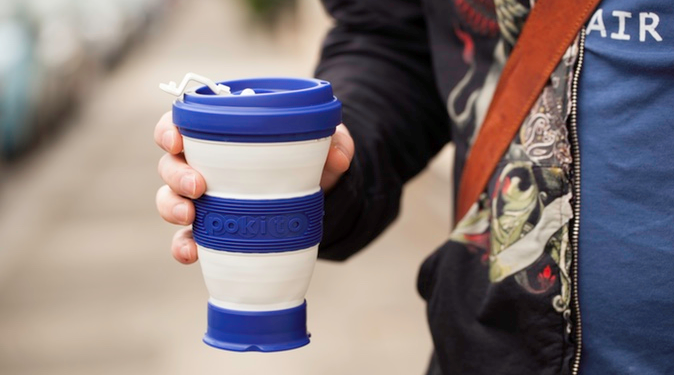 PCSG is supporting the Pokito kickstarter, and you can too – a very handy refillable mug that squashes down, doesn’t leak and is dishwasher proof! That’s one in the picture, up there ^^. Read more here – enjoy!